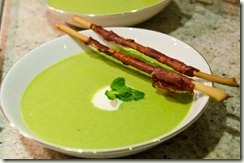 I have recently seen pea soup on several menus in our region of France, so thought I’d try creating my own for a dinner party on New Years Eve. I researched several recipes from some of my favourite cooks, Nigella, Delia, Nigel Slater to name a few, I googled and checked BBC Good Food and came up with a melange of several recipes. Felicity Cloake of Word of Mouth Blog, The Guardian deserves a mention as I found her research of the humble pea soup most interesting and the fresh versus frozen debate. Nigel Slater says frozen peas are a “dependable delight” in his book Tender (although he admits they lack “romance”) well romantic or not, being mid-winter in the snowy Haute Savoie and not a fresh pea pod in sight, frozen petits pois are the main ingredient of my pea soup recipe below and I used a local Jambon sec de Savoie to replace the Parma ham. 1. Heat the butter and olive oil in a large saucepan, add the leeks and bacon and sweat until cooked, do not colour. 2. Add the peas and water, bring to the boil and simmer for about 2-3 minutes, until peas are soft – do not overcook the peas. 3. Puree the soup with a hand blender and add lime juice and seasoning, I used freshly ground white pepper but didn’t need to add any salt. If you wish to sweeten the soup add a little sugar. To thicken the soup slightly and add a lighter green colour add double cream to your own taste. 4. This soup can be made in advance and reheated. Serve with a garnish of mint and a dollop of creme fraiche. Heat the oven to 180C/fan 160C/gas 4. Wrap each breadstick with a piece of ham (I cut the ham in half lengthways makes it easier to wrap the length of the breadstick) and bake for 10-15 minutes or until the ham crisps.